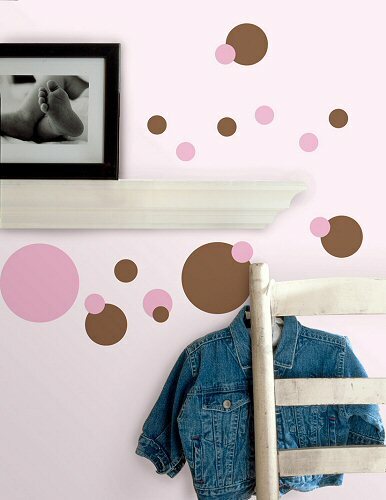 Pinks and browns are all the fashion rage and these peel & stick decorating dots are a fun and whimsical part of any room decor. Our repositionable Just Dots (Pink & Brown) wall decals are easy to apply, easy to reposition, and are wall decor that will create a cheerful atmosphere for years to come. Our RoomMates Just Dots (Pink & Brown) wall decals (also known as wall stickers or wall appliques) are repositionable, removable, re-usable, and washable... a parent's dream combination for kids' wall decorations. Whether you are transforming bedroom, playroom, or even classroom walls, our peel and stick Just Dots (Pink & Brown) wall stickers offer decorating ease with no damage or residue to the surface when removed.